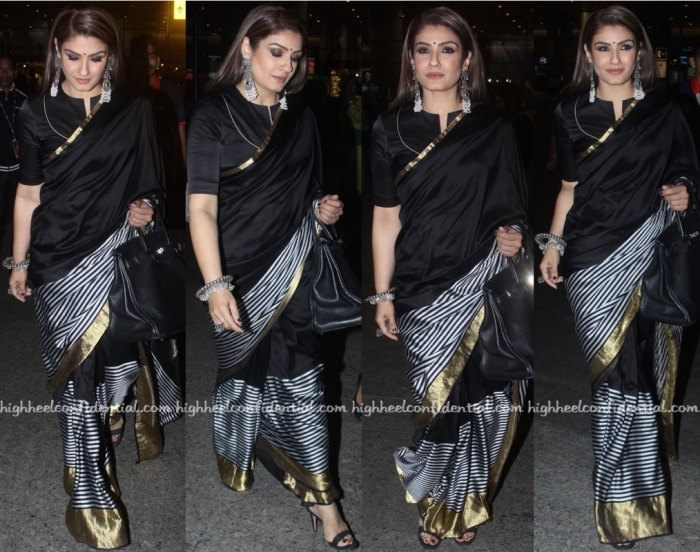 Post attending an event in Delhi, Raveena was photographed in a Raw Mango sari while exiting Mumbai airport last evening. Silver jewelry, an Hermes tote and pair of black sandals were among her accessories of choice. She looked nice. P.S: See Vidya Balan wear the sari here and Neha Dhupia, here. And see Kajol sport a version here. We do not give you enough credit ladies, than you for all you’re doing. it is a very hit Raw mango saree, came out about two years ago. Price also affordable at around 25000. I myself have two of these, a pink and a ice blue. They are very classy. Electric blue , I liked that most. Hi shakuntela, how do you buy this saree? Can You buy it online? Raveena usually does well. She looks good. Such a gorgeous face! She looks sharp and sophisticated. Perfect styling except for the bag. I love the sari on her but wish she had skipped the earrings or gone for subtler ones! Raveena wears it the best! First time her footwear doesn’t look bad either. Looks so modern and sophisticated. She styled it best. She looks stunning! The style of that blouse, the silver bangles/kadhas…all perfect! She looks beautiful here. I’m not normally a Raveena fa but he styling and make up are on point here. Raveena wore it the best. She looks gorgeous and so sophisticated. Absolutely stunning the way Raveena wears it! 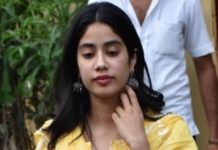 She looks the same as she did back during tip tip barsa pani days. Love!